I’ve been in Shanghai for three weeks while late September blisters in the low thirties, but from Wujiaochang to Xiantiandi malls there’s a worrying trend decking the shelves, rails and mannequins: winter warms. I’m talking tweed, heavy woollen jumpers and puffy parkas fit for the arctic – that promise to do nothing for my chubby cheeks. It’s hard to believe that the city who’s pavements were literally searing meat in high summer are about to plunge into the single digits and below, but the locals seems to think so, and I’m going by the old saying that it’s better to be prepared than look like an ice Popsicle… Or something along those lines. We can thank the clever people in the design world for always being two seasons ahead of the rest of the world. In light of their forward thinking, I’m taking a quick nip around this years AW campaigns that were released this Spring to jog the old noodle for some parka palettes and insulating inspiration for the coming cold. So the shiny polyester-look puff coats may look daunting for any regularly sized person to pull off, but it’s also one of the biggest trends I’ve seen in the shops here in Shanghai. True, I’ve never spent a winter here, and have yet to see if these luminously painted items ever grace the streets (and if the ladies here have the chutzpah to do so), still – don’t knock what you don’t know! 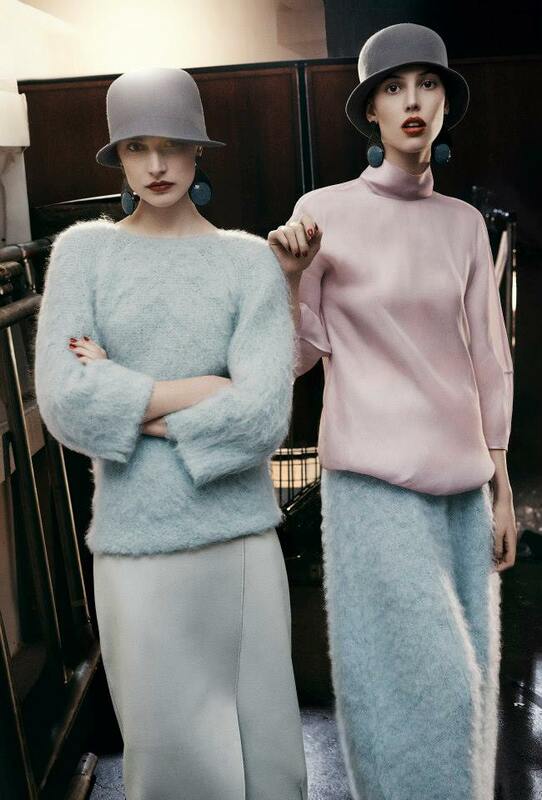 Certainly there’s a lot here in Miu Miu that’s prevalent across 2013’s AW campaigns: the below the knee hemline, long winter coats over short jackets, and the tendency towards traditional shapes and 1950s retro styles. I adore the arts-scene background to this campaign, the girls high-ankle boots, chinched waist coats and neck-scarves are like the indulgent piece on a stage. Bringing back tights, and rich dark colours in one fell swoop. It’s sepia warms for DKNY’s AW campaign. They’ve taken to the street trend and championed it full force for the winter, sticking to hipster chic (and big names) and stomping all over Urban Outfitters with the sheer expensiveness of what they can produce. From layered knits to concealed heel kickers, the practicality of the pieces get a big thumbs up here while I’m looking for winter inspiration. Thinking the dark olive and grey palletes are so versatile (I LOVE GREY), while chunky wool and leggings? What’s not to love? The skateboard in this campaign does make me laugh though, I can only imagine someone seriously thinking: what’s more hipster than a skateboard in a fashion campaign? … I’m thinking maybe they should have tried a short board. There’s something I’ll always love about the blatantness of asian, african and white girls modelling together. Of course, I love seeing Asian girls modelling anything for big brands, considering how unrepresentented they are in the Fashion world. They sure are on the up. What is it about this campaign that makes it so beautiful? There’s rich colours, laced and intricate patterns and the smart Oxford-meets-Spain style to the collection simply feels wonderful. There’s retro here, but it’s in a period-piece kind of feel, and true to form it’s reflected in the location of the shoot – not to mention the trimmed stubble male accessories in these shots. Ow. 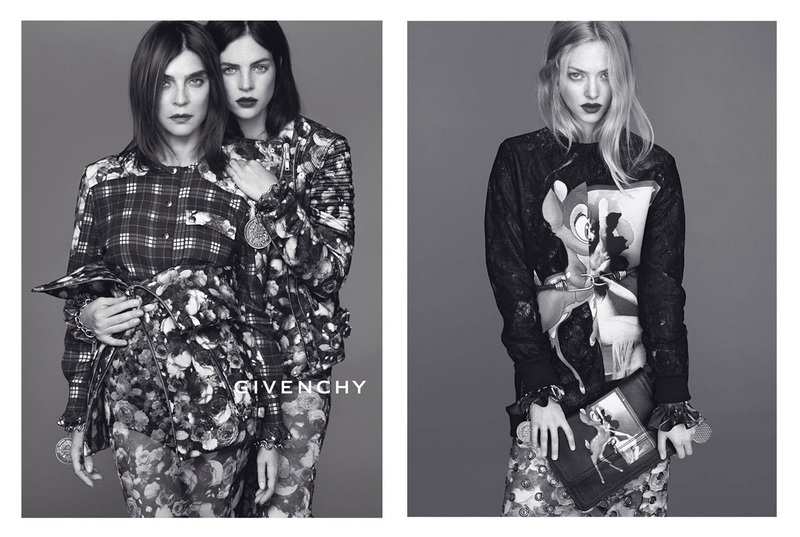 The prints in the Givenchy AW campaign are just off hurting my eyes, but it’s so that I can’t look away. The Roitfield family’s mother/daughter combo of multi-clashing print is a little agonizing for the print-shy, but it’ certainly as beautiful as it is confusing. By absolute contrast, Amanda Seyfried is looking a slouchy kind of hot (and yes, that’s totally possible) in a very clean interpretation of a London-esque grunge. From the baggy sweater to the plush frills and rose vs. bambi cartoon print, it’s a girl power trip that benefits from a striking dark lip and the blessing of black and white. It’s another move into a slightly androgynous, loose fitting look that seems to be echoed in the boy-cut long coats around these campaigns. And while you’re going to have hard work convincing this stubborn twenty something into any print, Givency, Amanda has me sold on some pretty grunge. There’s so much to love about Tim Walker’s work with Mulberry; it’s put the designer on the map for me like nothing else possibly could have this year. I mean, Cara, owls and a little pretend tree? Who thinks up this kind of magic?! There’s a reason there are three shots of Armani’s campaign to this post, and it’s 100% because there is just so much fashion inspiration, creation and beauty to appreciate for the coming season. From the period look, to the high class, and the elements of the totally steal-it-off-the-model-and-wear-right-now – I think these shots are absolutely to die for. As if this shoot wasn’t sensual enough, did you ever think it could be done with NO hair, ONLY hats, and MINIMAL skin? I adore the pantaloon-esue billowing trousers which look oh so comfy, the lightness of the pale and pretty sweaters, the length to the trousers, skirts, and coats, the shimmer of brogues, and the deep, detailed prints. The work here is so classic, and high-fashion that it makes me shiver with how wearable and alive these 1930s reminiscent pieces are. If only I looked so good in a hat like that. Let alone a drop waist. I’m thinking of these things: long coats in above the knee with period-costume-esque loose but clean cut, thick knits, ankle-length skirts and trousers, printed grunge sweaters and fuffy jumpers, rich colours and pastels, (p)leather, concealed heels sneakers, messy updos and some drop earrings.